An impressive heat tolerance makes this the ideal daffodil for southern gardening. A hard-to-find historic variety that produces clusters of sweetly scented, quarter-sized pale yellow flowers, each with a darker yellow cup, in early to mid spring. Along with its usefulness in the South, landscapers enjoy the bulb for its massive color impact and ease of culture—it thrives even in heavy clay soil. Grand Primo Daffodil is reputed to be one of the most robust and floriferous of the daffodils. 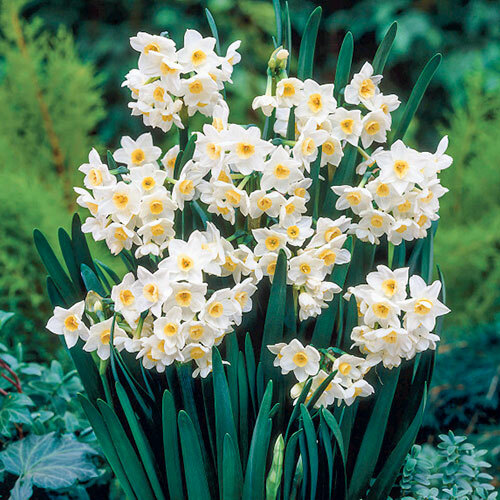 Growing 14-18" tall, daffodils, or narcissus, grow best in full sun to partial shade. They're deer resistant. The flowers delight in the garden, naturalized areas, borders and cut-floral displays. Flowers can be cut when petals have faded, so they won't go to seed. Seed formation drains off the food bulbs need to produce next year's growth. Leaves should be allowed to die back naturally before removing. A winter mulch, 2-4" deep, of straw, evergreen boughs, peat moss or shredded leaves can be applied after planting in areas with severe frost.